IN light of the current economic state, in which numerous exogenous shocks have negatively impacted Namibia’s developmental trajectory continuous dialogue is needed to objectively assess and propose alternative approaches. In this regard the President of Namibia, Dr. Hage Geingob has reconstituted the Presidential Economic Advisory Council into a High Level Panel on the Namibian Economy. During the appointment of the High Level Panel dr. Geingob said the single-minded intent for reconstituting this Panel, is to solicit evidence-based recommendations, strategies and interventions that will prove effective in reviving and accelerating inclusive economic growthand employment creation through investment led by the private sector. I am pleased to welcome you to State House for this special event. You will recall that during the opening of 2018 Cabinet Year, as well as in my 2018 State of the Nation Address, I expressed my intent to reconstitute the Presidential Economic Advisory Council (PEAC) into a High Level Panel on the Economy. Today, I am pleased to announce that this commitment has been fulfilled. 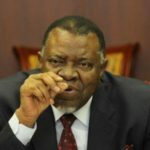 Upon Independence, Namibia inherited a skewed economy, as a direct consequence of our pre-independence political legacy. Although our democracy has established sound Governance and Macro-Economic architectures, underpinned by a solid foundation of, Peace, Stability, Unity and the Rule of Law, deficits persist within our SocioEconomic landscape. In order to strengthen the tripartite collaboration between Government, Labour and the Private Sector, the Presidential Economic Advisory Council (PEAC) was formed as a voluntary platform to strengthen the social compact between these three key actors. By virtue of the powers vested in me by Article 32 3 (i) (hh) of the Namibian Constitution, I have appointed the members of the High Level Panel on the Namibian Economy (HLPNE). To ensure we are more proactive, resilient and innovative in our developmental approaches, I have broadened the panel to tap into local, regional and global intellectual capacities. In the wake of contemporary challenges and opportunities, there is need for continuous dialogue on our shared obligations to objectively assess and propose alternative approaches. In light of the current economic state, in which numerous exogenous shocks have negatively impacted our developmental trajectory, PEAC has been reconstituted into a HLPNE, with key deliverables stipulated in the Terms of Reference. Some have questioned the need to establish a High Level Panel on the Economy. The singleminded intent for reconstituting this Panel, is to solicit evidence-based recommendations, strategies and interventions that will prove effective in reviving and accelerating inclusive economic growth and employment creation through private-sector-led investment. In proposing future approaches, I urge you to consider the impact of technological advancements on the Future of Work. Contrary to widespread perception, the Fourth Industrial Revolution also has potential to unleash job creation opportunities. To this end, policy responses should directly give incentives to job creation as a primary target, rather than a by-product of economic policy. The quest for human centered development must remain the foundation for the future work. Distinguished members of this High Level Panel; your terms of reference are clear. Today I charge you, to swiftly commence with the task at hand, as you have a very limited time frame in which to deliver. Familiarize yourself with all Government Economic policies, since your work should be aimed at buttressing Government’s developmental agenda. I expect that you will work together in the spirit of Harambee and remain impartial in the execution of your responsibilities. Your experience and expertise are being called upon to deliver on your mandate. Distinguished Panelists, in appointing you, I express my absolute confidence and trust in your abilities to execute the demanding task before you. I congratulate you on your appointments and appreciate your willingness to volunteer your skills and knowledge, as patriots and friends, towards a “United, Inclusive and Prosperous Namibian House”. – Conduct rigorous analysis of existing economic policies, regulatory environment and the ease of doing business, to identify bottlenecks undermining the attraction and retention of investment and economic growth (e.g. structural and bureaucratic). – Recommend policy approaches, strategies and remedial interventions to revive and accelerate Namibia’s economic performance, through private sector led investment. – Examine demographic and technological trends that will affect the landscape for jobs and recommend measures to prepare Namibian workers for the future of work. – Under the leadership of the Vice President, supported by the Prime Minister and in collaboration with the Ministries of Industrialization, Trade & SME Development; Finance; Economic Planning and other key economic Ministries, coordinate the hosting of the 2019 Namibia Economic Growth Summit. – Ensure the Summit is preceded by adequate preparations and consultations with all stakeholders in order to build and sustain public-private sector consensus on proposed remedial interventions; mobilize resources for hosting of the Summit; develop a theme and agenda for the Summit and identify properly scoped investment opportunities to be promoted at the Summit. – Identify investment opportunities by domestic investors, through Public Private Partnerships in order to unlock private sector led growth. – Advise on the strategic development process of ‘Brand Namibia’, to position Namibia as a Tourism and Investment destination of choice, and Country of Origin for high value goods and services. – As and when required, act as an Advisory Body to analyze and review progress on implementation, identify constraints and render policy advice towards the realization of the National Development Plans, Harambee Prosperity Plan and Vision 2030. The Secretary to Cabinet, Dr. George Simataa shall be an ex-officio Panelist of the HLP. The HLP shall be supported by a dedicated secretariat, comprised of the Special Advisors to the President and drawing expertise and resources from within Government Offices, Ministries and Agencies. Panelists shall serve for a period of one year, effective 20 March 2019.